When you are learning site building activities with any of the self hosted platforms like wordpress.org, it is also necessary for you to know how to work with FTP applications. FileZilla is one of the easy to use File Transfer Protocol application widely used by webmasters to upload or download file from or to a web server. In this article we explain the overview of FileZilla application and important FileZilla Settings for beginners. 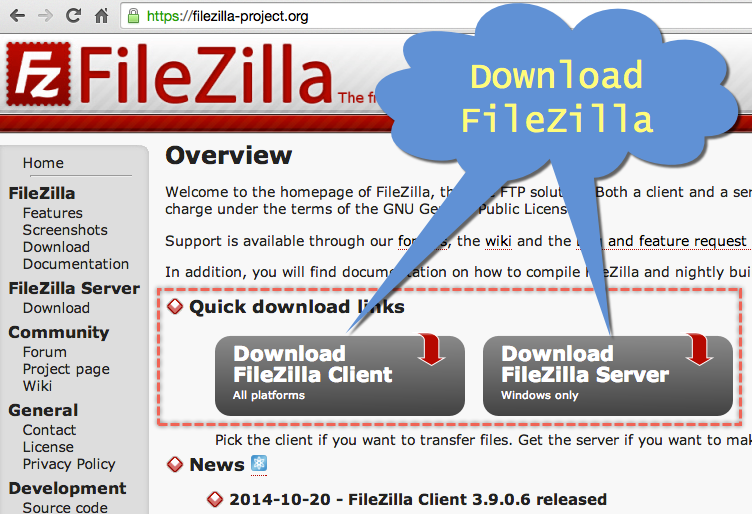 FileZilla is an open source software which can be downloaded for free from FileZilla project website. Both Windows and Mac based FileZilla client versions are available and download the one based on your need. You will be forwarded to sourceforge.net website and the download will start automatically. Launch FileZilla once you successfully installed on a PC or Mac and click on the “Site Manager” icon available near to top left corner. (The icon may be showing different in latest FileZilla versions). Click on “New Site” button. Add FTP account details of your hosting account. Click on “Connect” button to connect to hosting server. Once you connected to hosting server the screen will look something like below with various sections. 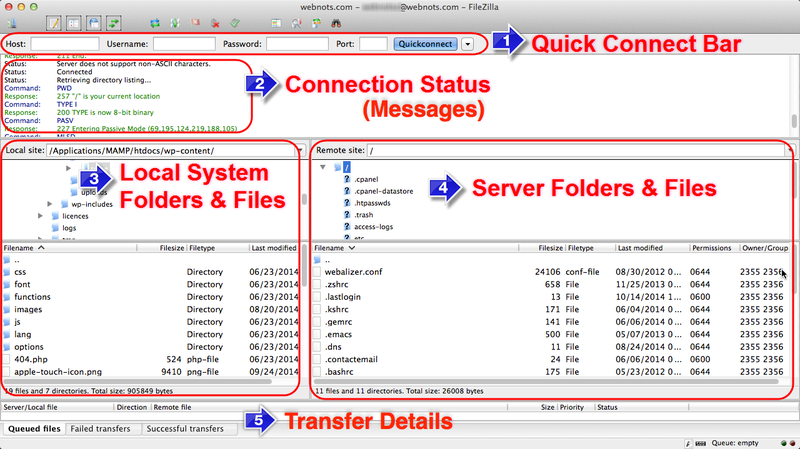 Don’t get panic by looking various sections, it will take few minutes for you to understand the screen overview of FileZilla. 1. Quickconnect bar – This is used to connect to your hosting server quickly. If you have already connected through site manager as explained above then this is of no use on the screen. If you connect using quickconnect bar then click on “Copy current connection to Site Manager…” option available under “File” menu to copy the settings to site manager. 2. Message Log – Here you can view the connection status, command and response when you open each directory of your site on the server side. The file transfer status will also be shown here. 3. Local Site – This section is divided into two hals and all the folders of a selected path on your local system will be shown here in the first half. When a folder is selected, all files and folders under the selected folder will be showing in the second half. 4. Remote Site – Like local site, this section contains two halves to show remote site’s folder and the content inside the selected folder showing below. Remote site is nothing but your live site hosted on the server. 5. Transfer Queues – Here you can view the status of the transfer when you download, upload or edit a file on the server. If you feel the screen is congested, you can enable or disable each section of the screen from the “View” menu or resize the viewing area by dragging the horizontal and vertical section dividers. 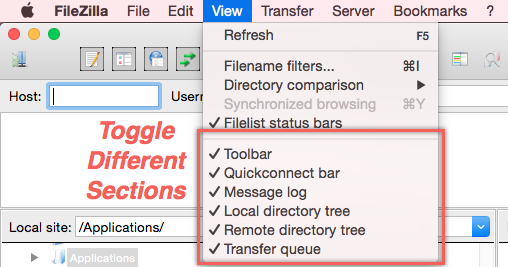 FileZilla toolbar shown above the quickconnect bar has quick shortcut icons for site manager, toggle each sections, disconnect server and few other options. Filelist status bars show the number of files and directories under the selected folders of local and remote site sections. Drag and drop files between local and remote sites to download or upload the files from or to server. You can also select the option of upload, download, delete, view and edit by right clicking on the file. Whenever you open and close the file from server, you will be automatically prompted whether you want to upload the edited file or discard the changes. 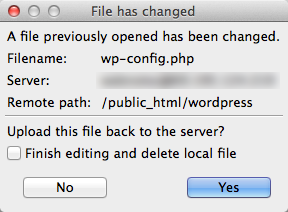 Click on the checkbox “Finish editing and delete local file” to delete the local copy of the sever file. This is an useful option when you open the same file multiple times for editing. Status of file upload and download can be seen both in message log and transfer queue sections. 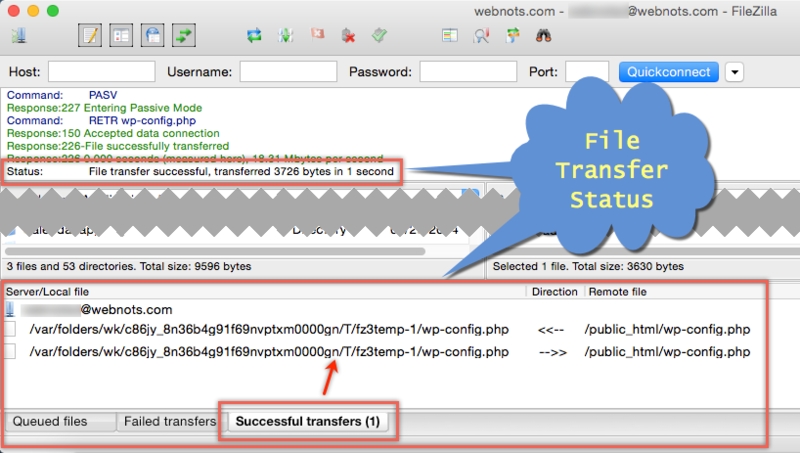 Transfer queue has three sections – Queued files, Failed transfers and Successful transfers and each sections shows the corresponding file’s status. Each file on the server is set with a permission to decide who can view or edit that file. Especially when you create a new directory, you may need to check or change the file permission so that editors from the front end can modify that file. 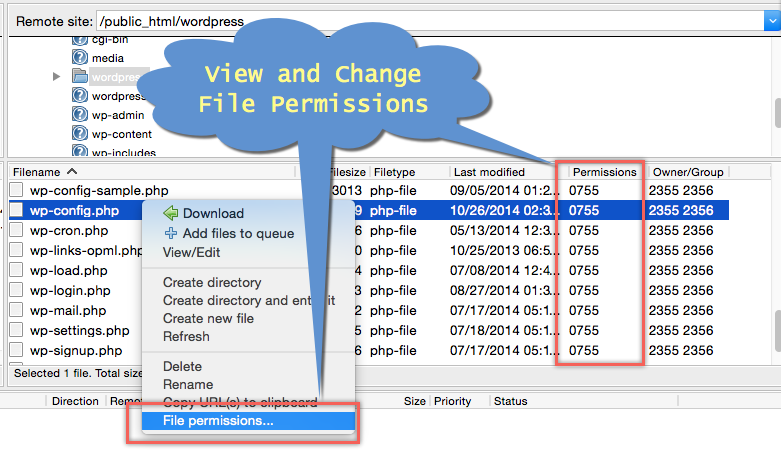 Current file permission can be seen under the “Permissions” columns and right click on the file or folder and choose “File Permissions…” option to change the permission. In the pop-up menu, select the read, write or execute option for each category of owner, group and public. 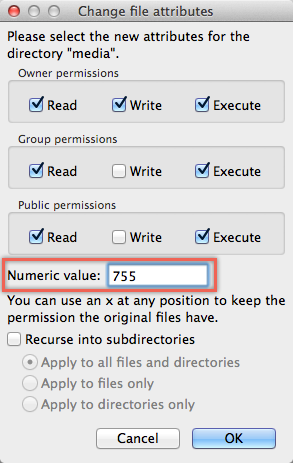 Based on the selection the numeric value will change which is the one you will be seeing under “Permissions” column as explained above. Depending on the server settings sometimes hidden files are not shown in FileZilla and hence you will not be able to see files like .htaccess. Select “Force showing hidden files” option from “Server” menu to view and edit hidden files. You will see a warning message like below when enabling this option. If you are not able to view normal directory structure properly then disable this option and try again. After you have completed the transactions it is recommended to close your connection by choosing “Disconnect” option from “Server” menu. Double click on the server file to download it to the local computer. Right click and choose View/Edit option to view or edit the file on the hosting server. Drag and drop files from local folder to server folder. Monitor transfer under “Transfer Queues”.